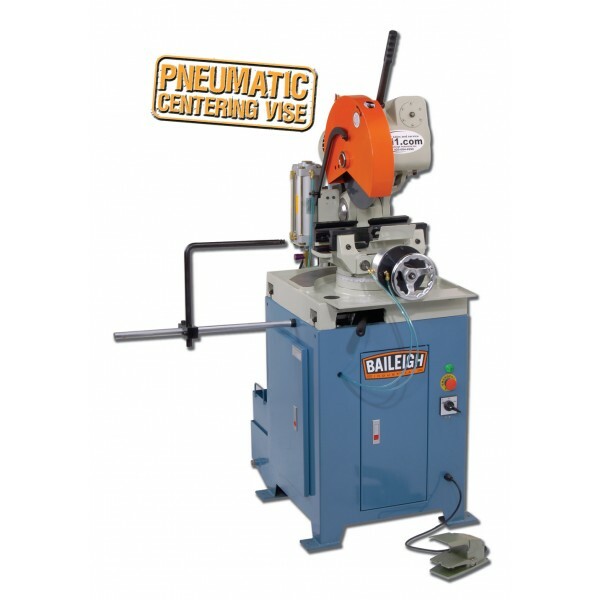 This semi-automatic cold saw cutting machine makes pristine cuts on a production scale. 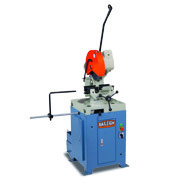 Its pneumatic vise and automatic return save you time. A flood coolant system maintains high quality. Accepts a massive 14” blade. 4.33” round tube capacity at 90°. You can switch between 2 speeds, 26 and 52 rpm, depending on your material. 4 hp motor runs the direct-drive blade and requires 220-volt 3-phase power. Miters 45° right and 90° left, which is important if you have any slotting applications. Rigid cast iron head minimizes vibrations so that the blade gives you high-quality cuts—and will for many years to come. 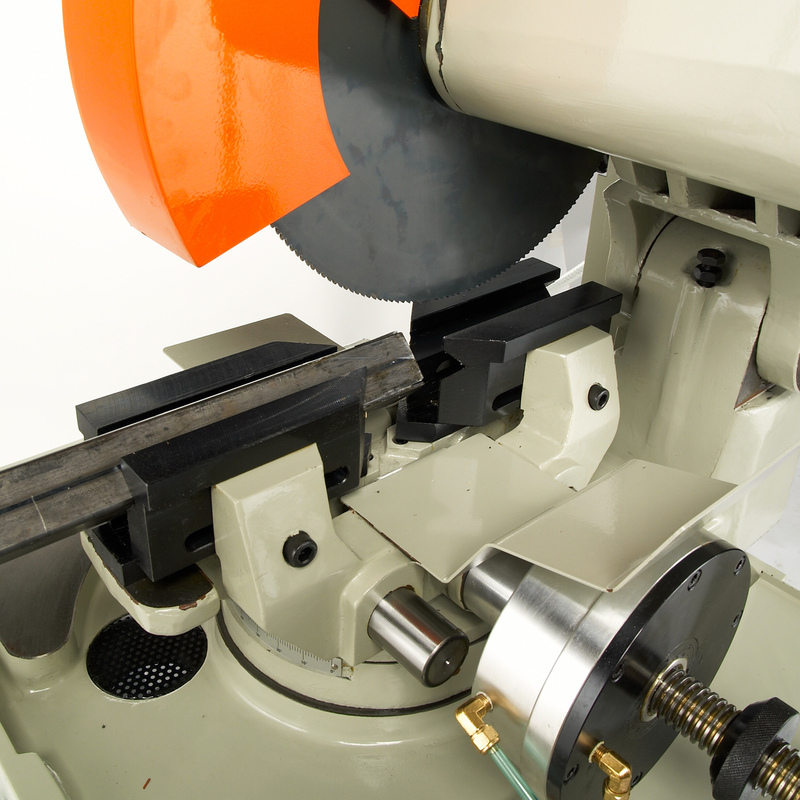 Ground and hardened all-metal gears in blade head ensure tight tolerances throughout the life of the saw. Backlash adjustment allows you to tighten the gears when needed and keep the saw accurate. Design adds semi-automatic features to our manual CS-350M, which has proven itself one of the best production saws available. Semi-automatic system is simple to operate. Simply put the material in the vise and push the foot pedal down. The saw handles the rest. The blade starts, descends, cuts, and returns on its own. 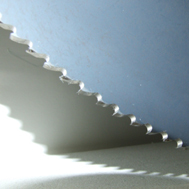 Once the cut is complete the blade will shut off and the head will raise back up. Air-powered vise, controlled by the foot pedal, clamps the material with jaws on both sides. American-style vise is self-centering. It keeps the material in the right position for the blade, so you don’t have to worry about different material diameters. 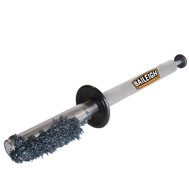 Steel stop rod allows you to cut repeatable lengths conveniently. Rigid cast iron saw base maintains accuracy and high cut quality by preventing the blade from wobbling. Durable folded steel stand puts the machine at a comfortable working height. Flood coolant system lubricates the blade and helps it deliver clean, precise cuts, like only a cold saw can. Integrated coolant system makes blades longer, so you spend less on replacements. It also prolongs the lifespan of saw itself. We stock replacement parts so we can ship them to you quickly. This circular cold saw comes covered by a 1-year parts warranty. 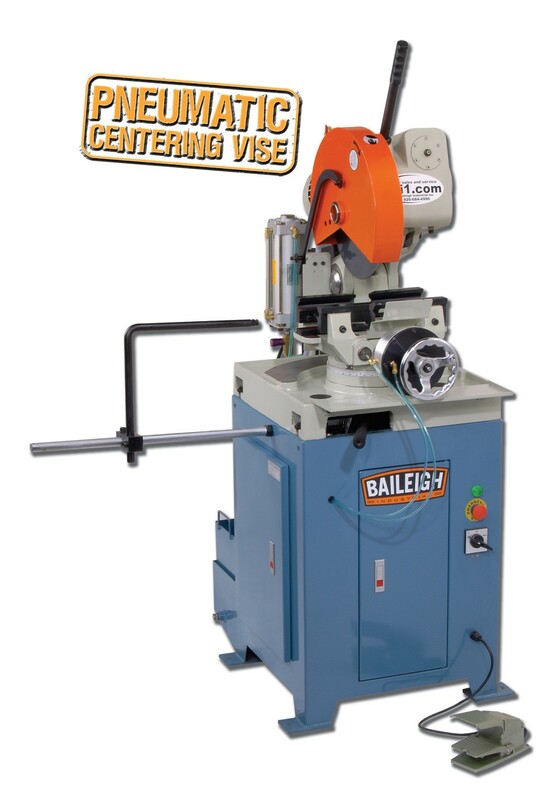 Lifetime technical support by phone means that you can talk to a Baileigh rep with hands-on machine experience whenever you need help. Recommended for: Production cutting of thin-, medium-, or thick-walled pipe, as well as tubing, extrusions, or solid bar stock. I wanted to tell you that the CS-350SA is one sweet little machine! Yesterday I ran 80 parts and the variation was .004 inches or less! That was a 100% inspection. Not believing my results, I ask our engineer to check them. He pulled 25 random sample and confirmed the results. I couldn't believe the repeatability of a simple machine like this one.